Arsenal striker Danny Welbeck went off injured early on in tonight’s Europa League clash with Sporting Lisbon with what looked a really nasty leg problem. 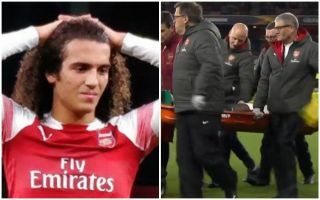 The England international was treated on the pitch for several minutes as his team-mates looked disturbed by what they’d seen, with Matteo Guendouzi seeming to have been particularly shaken. Welbeck was given oxygen and eventually stretchered off, with Pierre-Emerick Aubameyang coming in to replace him.